A missal provides all the prayers, hymns, and readings necessary for the celebration of Mass over the course of the year. This deluxe 15th-century missal made for use on the altar was given to the church of St Lawrence in London by William Melreth, alderman, textile merchant of Broad Street and eventually member of Parliament, probably just before he served as Sheriff of London. Celebrated in September, the feast of St Michael was universally important in medieval Christianity, as he was believed to protect against enemies and the devil. Most saints' feasts are celebrated on days of death or birth, but Michael, being an archangel, had no date of birth and he was immortal. Instead of the usual sort of feast, his celebrates his appearance in the 6th century on Mount Gargano, in southern Italy, where a church was built to commemorate the event. 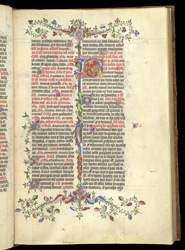 The historiated initial at the beginning of the prayers for the mass shows him in his most important role as slayer of the devil at the end of the world.